If Much Ado About Nothing is how Joss Whedon relaxes between his mega-blockbusters, please give this man a contract for the next five Avengers sequels. Shot secretly in just under two weeks at his home, this film reunites familiar members of the wider Whedonverse to deliver classic Shakespeare to a modern audience. 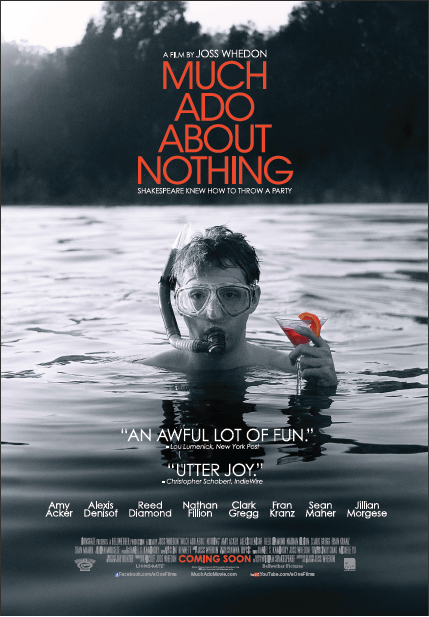 It’s been done before, by the likes of Baz Luhrmann and Gil Junger, but in my most humble, non-expert opinion, Much Ado About Nothing is one of the best modern adaptations of Shakespeare, using the original language, that I have seen. Everything about this film, from the soft black-and-white lighting to the scene blocking, is perfection. The cinematography and elegant use of costuming makes for a timeless milieu that is so spot on you want to believe it belongs as much in Shakespeare’s time as ours. During the outdoor “masquerade ball,” characters mill around in casual suits, flowy dresses, and traditional masks. An acrobat duo performs just overhead in a tree swing. It’s these small details that make this film feel like the world of Shakespeare’s theater. But it is the director’s brilliant interpretation of a fellow wordsmith’s original dialogue using physical comedy and visual cues that makes this adaptation undeniably the work of Joss Whedon. I never made the connection before, but there are many parallel trademarks between these two artists. Both write characters well, both write playful banter between characters extremely well, and both know comedy. These words maybe the work of Shakespeare, but Whedon interprets the dialogue by imbuing scenes with the way he knows modern comedic actors would interact physically with each other or their surroundings. Alexis Denisof’s Benedick and Amy Acker’s Beatrice are prime examples. Both characters overhear conversations about them between other characters and in their attempts to remain hidden dramatically dive behind bushes, hide behind twigs, or fall down stairs all while delivering quippy asides to the audience. The comedy is never anachronistic; each actor’s physical embodiment of their character and the Bard’s words flow organically from each other. I singled out Acker and Denisof’s performances, but the entire cast is brilliant. Who knew Whedon had so many talented Shakespearean actors hanging around? Nathan Fillion and Tom Lenk are also memorable as Dogberry and Verges, the team of comic incompetent police officers. Whedon plays a little bit with the original cast of the play, omitting some characters, blending others, including an interesting gender reversal for one of the smaller roles. As someone familiar with the work of Shakespeare but by no means fluent, I welcome well-constructed and thoughtful interpretations of his plays in the form of modern films. Even if you’ve never read this play (I have not, but I did some research) or any play of his, you will have no problem following this story. Whedon has crafted a masterpiece on screen that is as much Shakespeare’s as it is his own. Much Ado About Nothing opens today in Philly area theaters.